Over the past month, a large part of our offers have focused on Bordeauxs. From the peak in late 2011, prices have come down a fair bit and have found a base at the moment. We continue to encourage clients to load up on older vintages like 2000, 2003 and 2005 as they represent great value compared to recent vintages like 2009 onwards. I wouldn’t recommend anyone to buy them for investment yet but if you are looking for some good value clarets for drinking, now is the time to load up on bargains.Harvest in France has ended in late September, and the wonderful weather during harvest has boosted the quality of the grapes. We are looking at a reasonably sized 2014 vintage, which is likely to be more abundant than the ’13s. Hopefully this will put a cap on the continuously rising price of Burgundies! Some staggering news on the German front. The recent German VDP auction saw a double magnum of Keller’s 2012 G-MAX Riesling sold at an astonishing US$8000 (all-in price), which is equivalent to US$2000 per 750ml. German Rieslings remain a conundrum in the market where Egon Muller and Keller continue to command sky high prices while the rest of the top producers sell their top wines below US$100. We urge you to try the dry Grand Cru Rieslings from German producers as they probably represent the best value in the wine market now. In October, we will have more exciting new offers. Just a bit more of Bordeauxs. We will also continue with our Clos Series offers, including Clos de la Roche and Clos St Jacques. Also some new 2012 Burgundies entering the market. If you are looking for a particular wine, do drop us a note. Some of our offers go direct to clients who have expressed interest to us. Exciting times ahead! In October, we will be serving our wines at two events. The first is the American Club Annual Golf Championship on 10th October. The golfing will be held at SICC and we will serve our wines at the gala dinner at the AM Club itself. 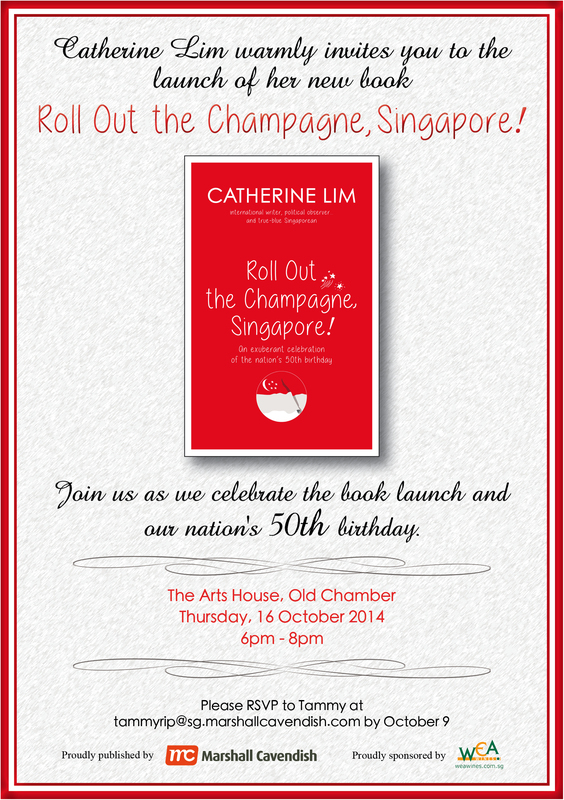 Secondly, we are also proud to serve our wines at the launch of Catherine Lim’s new book “Roll Out the Champagne, Singapore!” on 16th October. If you are working around the Arts House/Raffles Place area, do come down after work to say Hi! and to check out the book launch.Catherine Lim, as many will know, is Singapore’s celebrated fiction author and prominent political commentator. She has written almost 20 books across various genres – short stories, novels, reflective prose, poems, political and satirical pieces. The book encompasses 30 stories about ordinary Singaporeans at their best and worst, their joys and griefs and angers, their dreams fulfilled or lost. They are tales about the awesome human condition and the even more awesome human spirit, interweaved with the author’s vignettes of her nearly 50 years in Singapore. We started off the month with a fabulous lunch at Nicolas (reminder to myself that I have to do awine dinner there). 2004 Trotanoy started things off with a quintessential plummy nose. This was no weedy ’04 as it was ripe with lots of soil-infused action going on. Lovely stuff! It was a hard act to follow but the 2001 Maison Leroy Volnay mesmerized with its sweet core of red fruits. This wine is so pure with stunning intensity and a lengthy finish. This is the perfect example of power without weight! Following that, a birthday bash for a dear friend where all the wines were blinded. 1996 Verget Bâtard-Montrachet got things going with a fantastic mineral core. I had guessed a Corton-Charlie as it was rather lean and minerally. 1969 A. Rossigneux & Fils Puligny-Montrachet was the next white and no one could guess it was a Burgundy. The wine was undeniably thin but overall it was very drinkable and no one could believe the age of this. A flight of Bordeaux started with 1969 Mouton Rothschild, a vintage which many wrote off. The mantra, “there are no good wines only good bottles” holds true here as this bottle was incredibly moreish and drinking beautifully. Next up, the legendary 1961 Ducru-Beaucaillou. While this was clearly the textbook example of a perfect Bordeaux, my vote goes to the Mouton for sheer drinkability. The Burgundy flight started with 1990 Joseph Drouhin Grands-Echezeaux, which was simply ravishing with tea leaves aromas and a fresh, balanced palate. Very fineindeed and clearly showing its pedigree. 1999 René Engel Grands-Echezeaux was big, powerful and tight – a crowd favorite but I found it too OTT for my taste. 2007 Jean-Jacques Confuron Romanée St. Vivant had lovely pure red fruits and silky tannins but was extremely structured. 2002 Thibault Liger-Belair Richebourg, one of the young vigneron’s early effort was made in a big extracted style but the balance is there. 2006 Ponsot Clos de la Roche was outstanding – very good acidity for the vintage, with sweet primary fruits and a long life ahead. 2006 and 2007 Gros Frère et Sœur Richebourg were paired next. The ’06 was bold with a nose of menthol and an intense power hiding beneath the considerable tannins while the ’07 was lighter in body but much more open now with high-toned floral and tea aromas. The night of hedonism ended with a 1999 Beaucastel CdP Hommage à Jacques Perrin. By this time, I was already knocked out and could only remember a big, liquorish wine with imposing structure and dark cherries. I’m guessing this needs 10 more years at least! We ended the month with yet another birthday and this time we had a MV Krug to start. Krug is one of my favourite Champagne houses as the full-bodied style is my thing and Krug always tastes like a white Burgundy rather than a Champagne (I often decant it to lose the bubbles). The legendary 1982 Lynch Bages came after. The green pepper/tobacco flavors and aromas were unmistakably a left-bank Bordeaux but the elegance was very Burgundian. This bottle seemed to lack a little punch though, perhaps needing more air time. 2007 Roumier Chambolle-Musigny was atypical for this early-drinking vintage as it was structured and unyielding (easily requiring 5 more years), but the pedigree is definitely there. A half bottle of 2005 Rieussec ended the night on a sweet, tropical note. This entry was posted in Outlook on October 7, 2014 by WEA Wines.